ProMat is one of the largest supply chain trade shows in the world—bringing hundreds of the industry’s leading innovators together in one place to showcase their latest manufacturing, distribution, and supply chain solutions. Each year, ProMat provides attendees with the opportunity to experience the best systems and equipment in the industry and to talk with leading providers face-to-face. This year’s show ran from March 23rd to March 26th at the McCormick Place in Chicago, Illinois. The show covered nearly 300,000 square feet and featured more than 800 exhibitors. The ProMat trade show is held in Chicago every other year, and—unlike other trade shows of its kind—is completely free to attend. Along with the trade show itself, attendees can also engage in their educational programs, which consist of more than 100 free conference sessions. The sessions include leading experts from the industry and provide the latest information on manufacturing and supply chain trends, technologies, and innovative equipment. 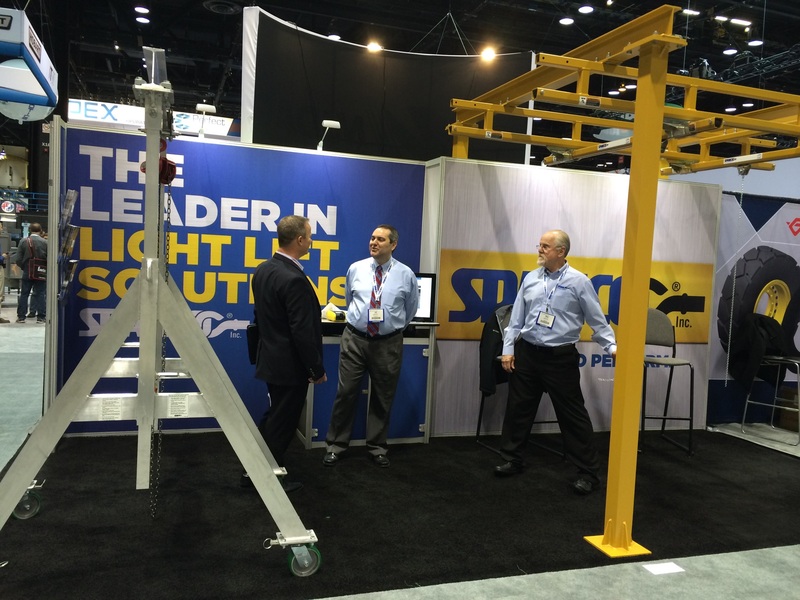 Spanco was one of the material handling exhibitors at this year’s ProMat trade show, with a new 10’x20’ booth featuring two of our most popular material handling solutions: an Aluminum Gantry Crane and Freestanding Workstation Bridge Crane. The Aluminum Gantry Crane was fully assembled to highlight the system’s portable efficiency and flexibility, and the Workstation Bridge Crane was temporarily installed to demonstrate our enclosed track and ease of bridge/trolley movement. ProMat exhibitors come from all over the world to showcase their newest equipment and technologies and include supply chain solutions from multiple industries. Aside from material handling equipment, ProMat also features packaging and shipping equipment, inventory management and controlling technologies, dock and warehouse equipment and supplies, automatic identification equipment and systems, and supply chain management solutions. For more information about the 2015 ProMat trade show or the upcoming 2017 ProMat trade show, please visit their website at www.promatshow.com.